I have an IC2200H mounted on my operating table with 25mm clearance above the radio and ample room for convection currents to assist in heat removal. It is concerning that the case temperature reaches temperatures that are not safe to touch, temperatures in excess of 75° (55° above ambient) have been measured and that has not triggered the internal temperature protection… so it could get hotter still! This is one of those high power mobile radios that advertises no fan as an advantage, but it is clearly not up to the task! The objective of this change is to keep the external parts below 60°, the (ASTM standard C1055 1999) 5 second human skin burn threshold. Mag loop or radiating dummy load? There is a seemingly endless series of articles on small transmitting loops on the cheap. 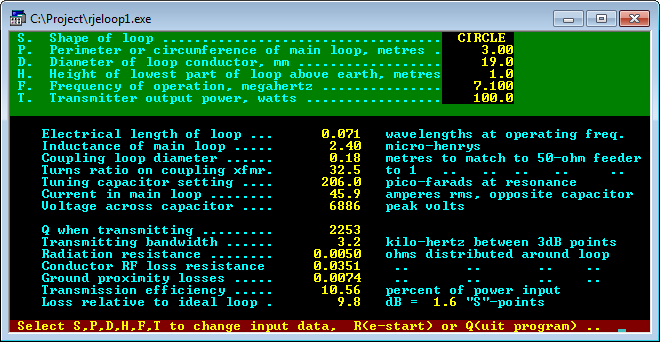 (eHam 2014) is another, it describes a so-called magnetic loop for transmitting on 14.2Mhz using 4.57m of 2.6mm copper wire for the main loop. The author reports the bandwidth of the finished antenna as 100kHz. One of the claimed benefits is that with such wide bandwidth, a variable tuning capacitor is not required. 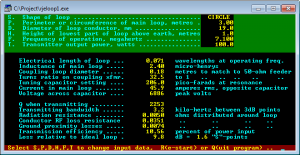 Continue reading Mag loop or radiating dummy load? 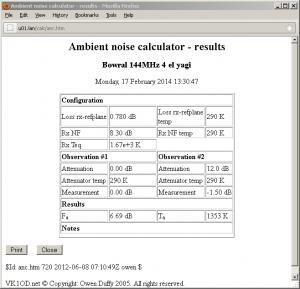 I made a measurement of ambient noise on 144MHz this morning using the technique described at (Duffy 2009). First step is to recheck the NF of the receiver. The TS2000 is getting a little tired, NF=8.3dB. 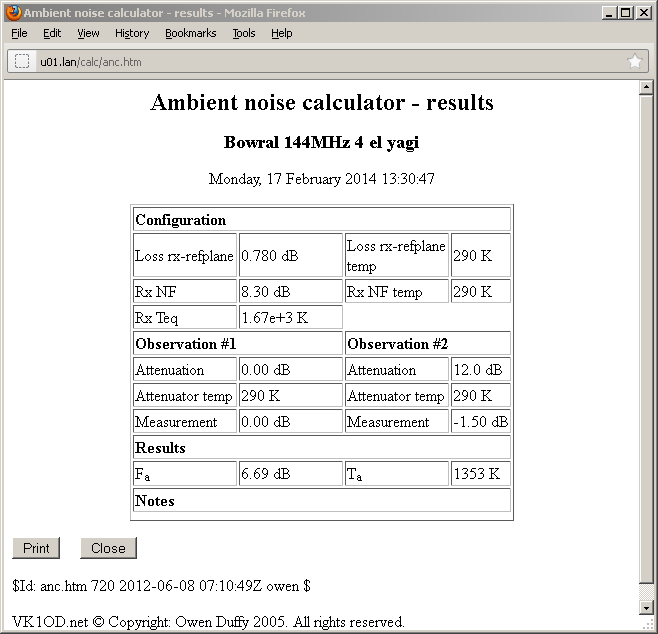 The technique calculates ambient noise from the variation in receiver output noise of a receiver of known Noise Figure with the insertion of a known input attenuator. The receiver output noise was measured using NFM (Duffy 2007) which allowed integration over 20s for high resolution measurement. The G5RV Inverted V antenna system at VK2OMD is fed with 9m of home made open wire transmission line using 2mm diameter copper wires spaced 50mm giving a line with characteristic impedance of 450Ω. (Varney 1958) described the tuned feeder configuration of his popular G5RV antenna system. I saw a recent ‘maker’ video describing a small transmitting loop for 40m. The loop used a 3m length of 19mm copper pipe formed into a circle, and at the gap where the ends almost meet, a tuning capacitance is synthesised using coaxial cable. 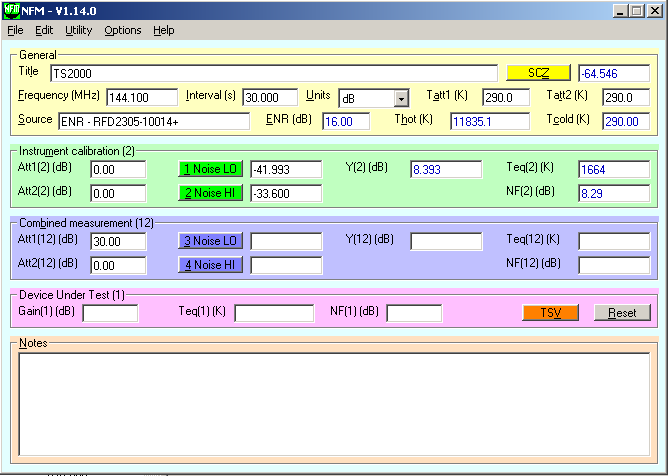 Above is a screen shot from Reg Edwards loop design program. It calculates the radiation resistance at 0.005Ω, loss resistance of the loop at 0.035Ω, capacitance to resonate it of 206pF (Xc=108Ω), and a bandwidth of 3.2kHz. I described a method for designing antenna systems to avoid excessive voltages in baluns and ATUs at (Duffy 2011) . 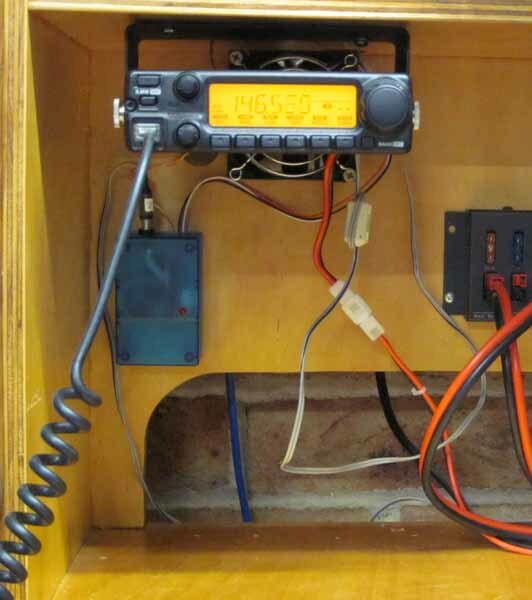 This article reports post implementation measurements of an antenna system designed using that method and using a G5RV Inverted V with tuned feeder and ATR-30 ATU with integral 1:1 current balun. The tuned feeder is a home-made line section of 2mm diameter copper conductors spaced 50mm, and 9m in length. An additional 0.5m of 135Ω line connects from the antenna entrance panel to the ATU.